Since entering the healthcare profession, I have suffered from contact dermatitis on my hands. These natural remedies have worked for me. 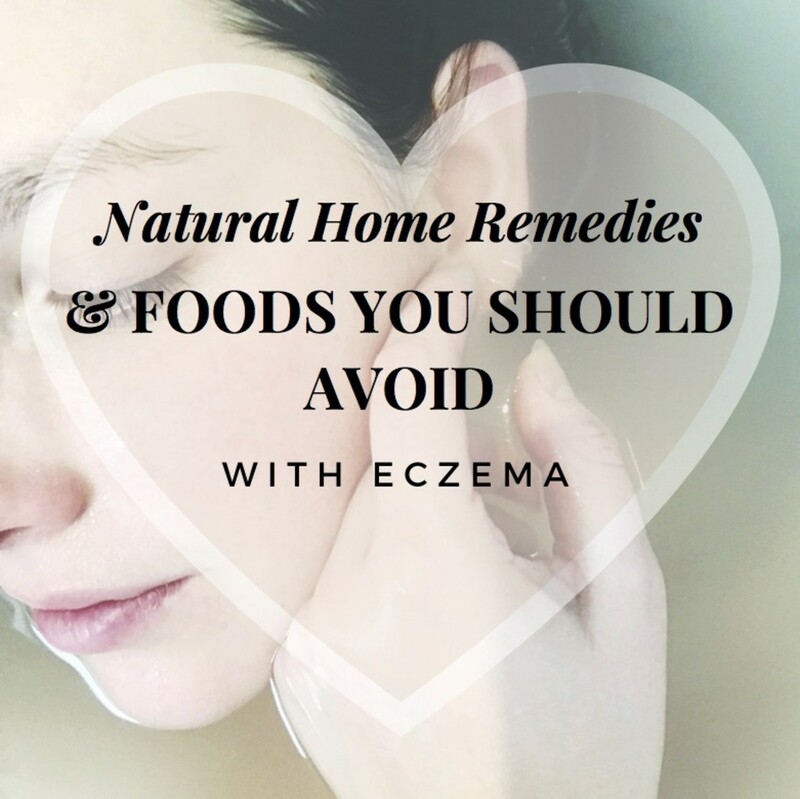 Whether you have been living miserably with contact dermatitis for years or it has reared its ugly head overnight, there are alternative ways to heal your skin and to keep flare-ups under control. While a doctor might want to prescribe steroid creams, ointments, or even oral medications for more severe cases, you don't always need to use prescription drugs to treat this condition. It is always advisable to visit your doctor or skin specialist for a proper diagnosis because it can be very easy to mistake a skin complaint with something completely different. Anybody who has had contact dermatitis knows how painful it can be. 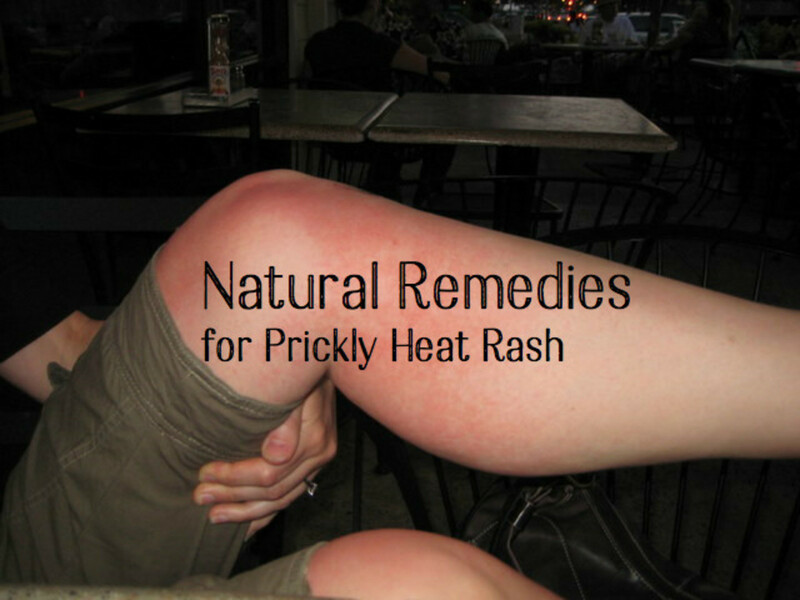 It makes your skin inflamed and sore. It also flares up when your skin touches something it doesn’t like (hence the name). There are two types of contact dermatitis: irritant and allergic (I go into more detail on this further down in the article). According to Dr. Tsippora Shainhouse (MD, FAAD, board-certified dermatologist and clinical instructor at the University of Southern California), "Contact dermatitis does not usually occur after the first application, but it can. It can worsen after repeated exposure to the product or higher concentrations of the product. Once the skin has been sensitized to the product, it often reacts to the slightest exposure." Contact dermatitis makes your skin incredibly dry and prone to cracking, putting you at risk for secondary skin infections, which are sometimes worse than the condition itself. It is always advisable to visit your doctor or skin specialist for a proper diagnosis because it can be very easy to mistake a skin complaint with something completely different. For instance, if you suffer from tiny little bumps or blisters on your skin, you could have pompholyx eczema. This is the skin condition I developed as a result of my contact dermatitis. Why Is Dermatitis on Your Hands So Common? The hands are most commonly affected because it’s the one part of your body that touches things constantly. In fact, you might be touching things that you are allergic to without even realizing it—especially if you frequently come into contact with hazardous chemicals or if you wash your hands a lot. Healthcare workers are at a higher risk of developing hand dermatitis since they clean their hands as many as 100 times per 12-hour shift! However, dermatitis can affect anywhere on the body, including your feet (shoe contact dermatitis) and eyelids. Your symptoms should start to subside two to four weeks after you identify the cause. However, while you search for the culprit and try to promote healing, here are some things to help you. 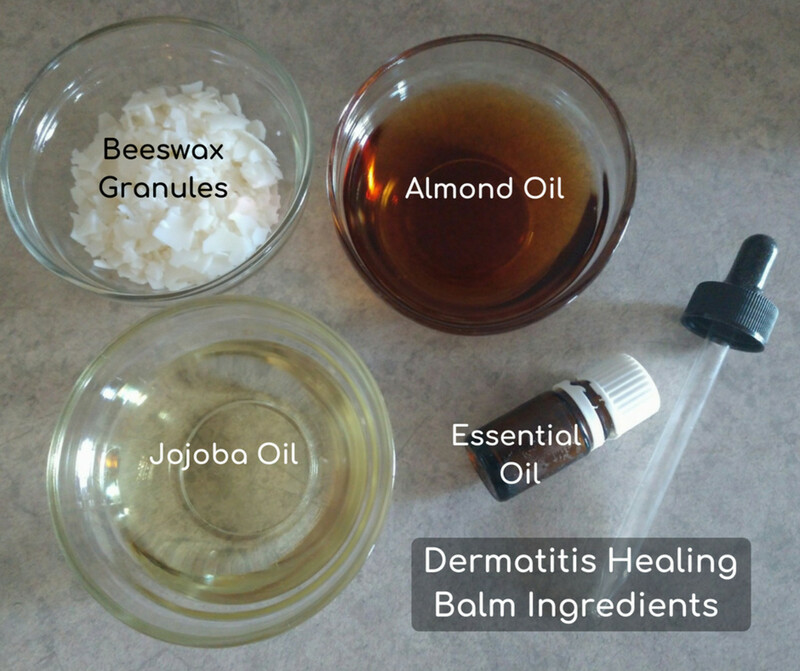 The ingredients for this dermatitis healing balm are pretty simple. A few drops of organic lavender essential oil. (You can substitute blue chamomile essential oil, tea tree oil, or patchouli oil.) Neals Yard sells the best essential oils in my opinion (by aromatherapy oils, I mean pure, organic oils extracted from plants, not the cheap adulterated kind containing synthetic ingredients and chemicals). Melt the beeswax, jojoba, and almond oil together in a double boiler until melted completely. Remove from heat and wait a moment before adding the essential oil. The reason you don't add the essential oil during the cooking process is that extreme heat denatures the precious oils. If you like your balm to have more fragrance, add more essential oil. Start to stir the mixture to blend all the ingredients together. The aim here is to stop the balm from completely setting into a hard block. By continually whipping the mixture as it cools, your balm will develop a lovely thick, mousse-like consistency. If you miss this step, the balm will completely solidify, and it will be very hard to get out of the pot. The whole process should take about five minutes, depending on the quantity of balm you make. A very small amount of balm will take less time to cool than a big batch. Spoon the balm into a clean, sterilized container such as a small glass jar. If possible, make sure the glass is dark blue or amber (easily found in aromatherapy shops or online) because it will protect the product from sunlight. Apply the homemade balm to the skin before bed every night and whenever possible during the day. This is incredibly soothing for dry skin. The essential oils help reduce inflammation and fight infection. Please do the sensible thing by patch testing 48 hours prior to use (just to ensure your skin responds well to treatment). If you are pregnant or breastfeeding, I suggest checking with your doctor for recommendations of safe oils to use. Alternatively, you could omit the essential oils completely. If you are allergic to latex or nitrile gloves, moisturizers and barrier creams are a bad idea to use until your allergic reaction has subsided. This can take as long as 72 hours. 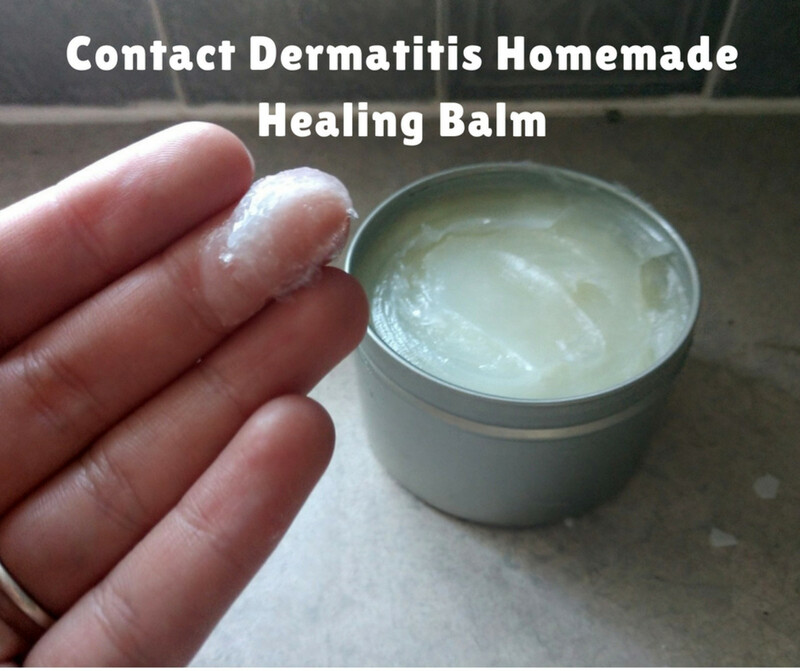 This homemade healing balm should help clear up your contact dermatitis. Try not to pick and scratch at your dermatitis since it will only delay the healing process. If you scratch in your sleep, try trimming your nails short and moisturizing your skin to ensure that it's well moisturized before you go to sleep. This should help to keep itching at bay. If moisturizing doesn't help, consider changing your moisturizer or covering the areas with dressing so you won't be tempted to scratch. To help relieve discomfort, take a warm bath or shower—also known as hydrotherapy. According to the Mayo Clinic, you should add uncooked oatmeal or colloidal oatmeal—a finely ground oatmeal that's made for the bathtub. Soak for five to ten minutes, pat dry, and apply moisturizer. Dr. Shainhouse recommends using Aveeno pouches but says that if you use cooked oats, be sure to toss them in the trash so they don't clog up the shower drain. Some vitamins and minerals such as vitamin C and quercetin actually help reduce the severity of allergic reactions. In fact, eating a healthy and varied diet will give your body the boost it needs to heal quicker. 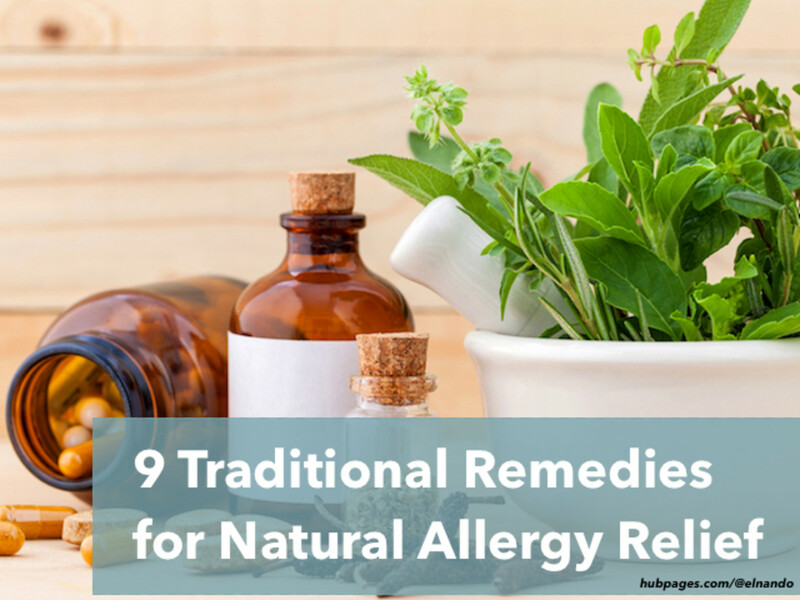 For advice on allergies, including tried and tested natural treatments, check out this comprehensive website by Natural Ways. Stress also affects the immune system and the body's natural ability to heal itself. This medical study explains how stress suppresses the immune system and why our skin reacts sympathetically to our emotions. This makes perfect sense to me. When I changed to a more stressful job, my hands were the worst they have ever been. At the very least, get as much sleep as you can. Try incorporating these foods into your diet as you continue to heal. Blueberries and blackberries have been known for their anti-inflammatory properties while omega-3-rich foods, including mackerel, wild-caught salmon, and walnuts, boost your immune system response and reduce inflammation. I didn't use these remedies to treat my contact dermatitis, but they are worth asking your doctor about or looking into. This is a more severe case of contact dermatitis. How Do You Get Contact Dermatitis? According to WebMD, if your contact dermatitis is due to an allergic reaction, your immune system is involved. After touching something you're allergic to, your immune system suddenly thinks your body is under attack. Your body then springs into action, making antibodies to fight the invader. This causes a release of chemicals that cause an allergic reaction. This is known as allergic contact dermatitis. Another type of dermatitis is known as irritant contact dermatitis, which is caused by touching something that took away the surface oils shielding your skin. According to the American Academy of Dermatology, this type of dermatitis is usually triggered by something at work and typically affects beauticians, nurses, bartenders, and other people who spend a lot of time with wet hands. Neither allergic or irritant contact dermatitis is contagious. 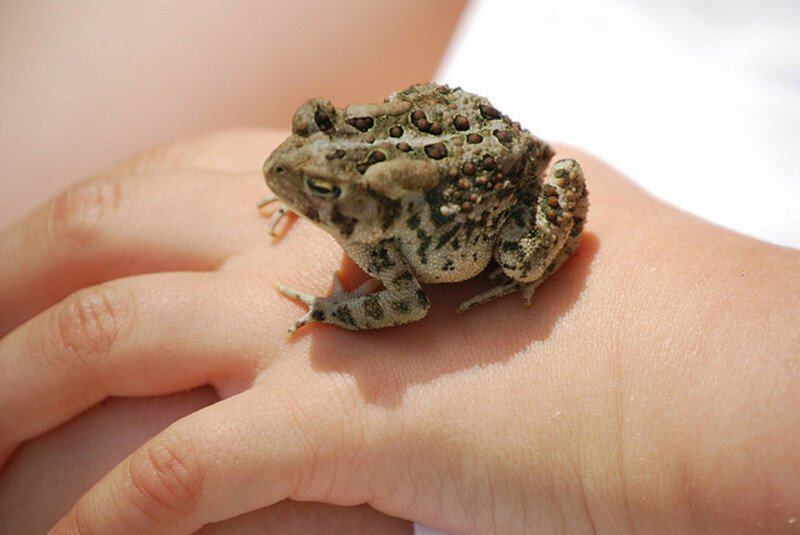 What Are Common Triggers for Contact Dermatitis? Leather—This can cause what's known as shoe contact dermatitis. Poison ivy and similar plants—This type of allergic reaction is known as urushiol-induced contact dermatitis since it's caused by the oil urushiol, which is contained in various plants. For me, the hardest part was identifying the things that were making my skin react in such a negative way and then trying not to touch those things. I thought carefully about my day-to-day life and discovered the problems through a sheer process of elimination. The cause of my sore hands turned out to be the nitrile gloves that we use at work (the so-called hypoallergenic gloves that replaced the latex ones). I also discovered that I had developed two food allergies, which amplified my symptoms. I had to remove these from my diet until my symptoms improved. After my skin had become sensitive, everything else aggravated it—hand soap; drying my hands on abrasive; cheap paper hand towels; preparing food, etc. When I removed the cause, the skin healed itself. How Do I Figure Out What Caused My Contact Dermatitis? When did you first develop contact dermatitis? 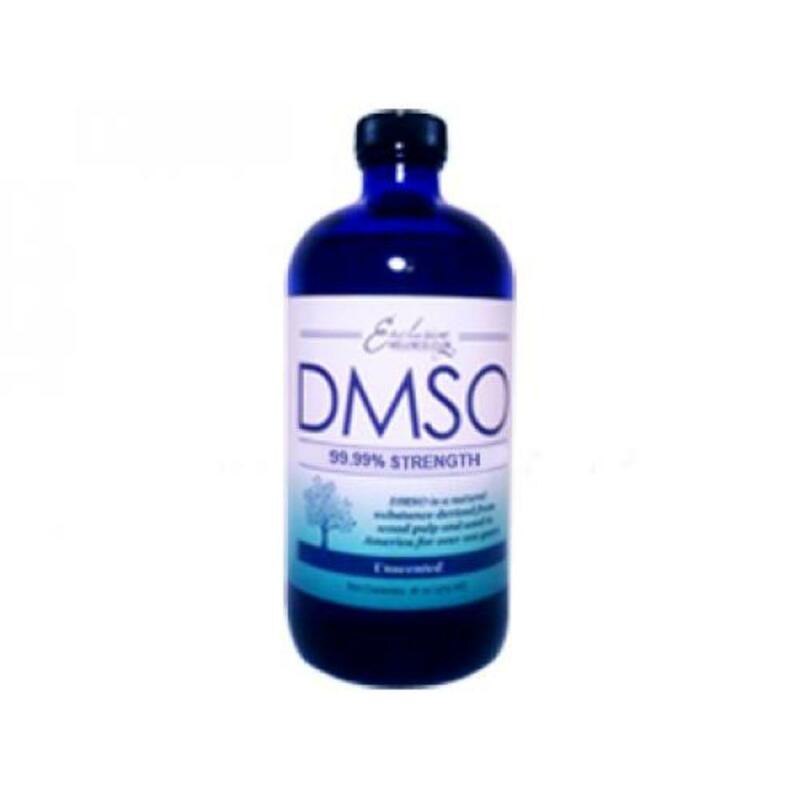 What have you touched within the last 24-48 hours that could have aggravated your skin? Do you have any known or unknown allergies to things such as nickel or preservatives? If you are not sure, get yourself allergy tested! It may give you an important clue as to the cause of your skin condition. I developed a milk and lemon allergy out of the blue one day. Do you wash the dishes or hand-wash clothes on a regular basis? The detergents might be irritating your skin. Have you changed the type of personal hygiene or domestic household products you use? It's important to also keep a journal to help you keep track of what things you come into contact with on a daily basis. Here are a couple additional ways to help you determine the triggers: You can get an allergy test done or have your doctor conduct patch testing on your skin. In the patch test, small amounts of various substances are applied to your skin under an adhesive covering. You'll then return several times over the following days to see if you develop any reaction. According to the Mayo Clinic, this type of testing is best done at least two weeks after your dermatitis has cleared up. If your affected skin starts oozing or gets worse, it's time to see a doctor. You may have an infection. Even if you have discovered the cause of your condition and you do your best to avoid the culprits, your skin will still be vulnerable to future flare-ups. This is because skin cells can stay inflamed for as long as eight or nine months after first aggravated. The skin may not look all that red, but it won't take much to upset it again! Before you know it, your skin will return to its sore and angry state the moment you come back into contact with the irritant or allergen. This can be a problem if you don't know what the cause of your skin condition actually is. Make it your mission to find out! When the skin begins to heal itself, take extra care to protect it from further damage. If your skin problem is caused by a food allergy, avoid it altogether if you can. This is when you will notice the inflammation begins to settle down. It can take several months to get to this stage, but it will be worth it! 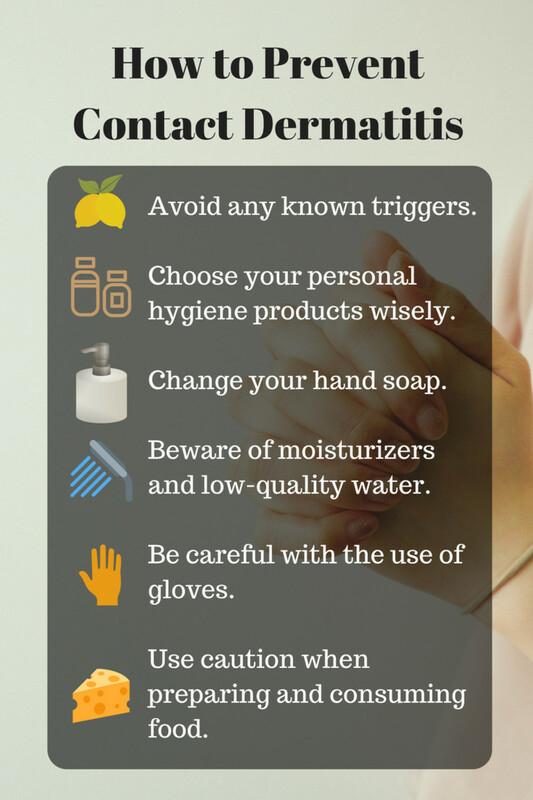 Besides avoiding anything that you know or believe triggered your contact dermatitis last time, here are some other ways to help prevent this painful skin condition. Finding high-quality bath, hair, and shower products is a positive start. They should preferably be hypoallergenic and free from fragrances and harsh chemicals such as sodium lauryl sulfate. You could also consider a "soap-free lifestyle." Personally, I love buying unscented products and adding my own aromatherapy oils—that way, you can smell fantastic and know exactly what goes on your skin. I don't like to use an aqueous cream to moisturize because if you check the back of the label, it says, "This product contains cetostearyl alcohol that may cause local skin reactions (e.g. contact dermatitis)." Aqueous also contains sodium lauryl sulfate and cheap mineral oil. Finding high-quality makeup products is also a must. Just because a makeup product's label says it's "natural" or "organic" doesn't mean you aren't allergic to something in it. If you're still searching for the cause of your dermatitis, it's best to stick with allergy-safe makeup. Many of us have our hands in and out of water and detergents all day because our job or lifestyle requires us to do so—we can’t just skip washing our hands altogether. What should we do? If you haven't already, it would be a good idea to change your hand soap. You can purchase a small, empty, travel-sized bottle and fill it with hypoallergenic, scent-free soap, which is handy when you are on the go. I take one with me to work and another in my handbag for when I am out and about. Keeping the skin soft and supple is important, but beware, moisturizers can in some cases push allergens and irritants deeper into the skin and make the problem worse, especially in the case of latex or nitrile glove allergies. On the other hand, if your skin is sore because of too much hand washing, moisturizing is very important to help the skin retain its vital moisture levels. Please try to do some research before assuming that moisturizers and barrier creams are the answer. This is why visiting a dermatologist is so vital. They are trained to know information like this. In addition, water can be a big problem where contact dermatitis is concerned—a lot of articles cover this subject briefly but very few talk about the quality of the water supply itself. Tap water contains vast amounts of metals, minerals, and harsh chemicals such as chlorine, fluorine, and pesticides in order to kill off dangerous bacteria and microbes—but at what cost? Since investing in a shower water filter, I have noticed a dramatic difference in my skin and hair—my skin isn't so dry, my hair is shinier, and my eyes don't feel as irritated by the water when showering. For anyone wanting higher-quality water, I definitely recommend buying a water purification system for your home. Water filters range in price, depending on your budget and needs. For around £30 (around $40), you can buy an attachment for your shower head that removes most of the harsh chemicals. Secondly, keep an eye on the temperature of your water. Water that's too hot can strip the skin of its natural oils and inflame the skin—a real nuisance if you are a lover of hot baths and showers like I am! For some of us, gloves are a necessity for the workplace. If you are unlucky enough to have an allergy to the gloves themselves, you face a huge challenge. Without them, you are exposing yourself to a multitude of health risks. With them, you are causing yourself an equal amount of harm. The most common glove allergy is to latex, although nitrile is also problematic for some. Hospitals generally use nitrile gloves these days instead of the traditional latex variety because they are believed to be hypoallergenic. For the rare few who are allergic to nitrile, however, one can experience some pretty severe reactions. According to my occupational health department, you can experience an allergic reaction from latex and nitrile for up to 72 hours after exposure! 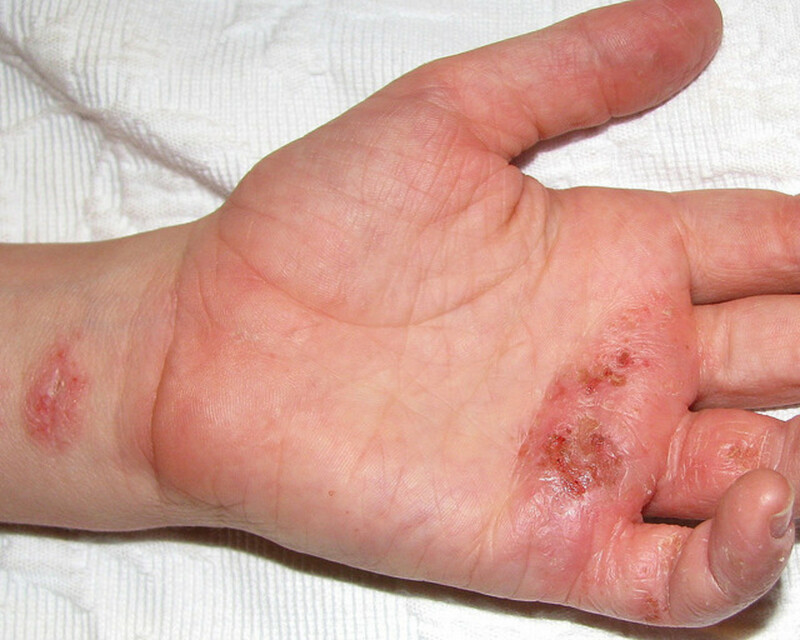 Sometimes though, gloves can simply aggravate the symptoms of contact dermatitis. The latter happened to me. One day, I suddenly developed a nasty rash all over my fingers and palms. At first, I thought the gloves were to blame, but as it happens, I was later diagnosed with a new food allergy. Who would have thought that an allergy to dairy could cause a nasty localized rash all over my hands? The rash didn't appear anywhere else. The gloves basically amplified my symptoms because it made my hands hot and sweaty. It wasn't long before it progressed to full-blown pompholyx eczema. I overcame this by cutting out dairy from my diet and wearing cotton glove liners underneath the nitrile ones for several months until all the redness and inflammation disappeared. When my skin was completely healthy, I was then able to wear nitrile gloves again without cotton liners! If it wasn't for the cotton liners, I don't think I would have ever healed my hands. Some foods can create negative skin reactions when touched or eaten. If you are allergic to nickel, for instance, there is a small possibility you might be allergic to foods containing nickel too. Like with anything, intolerances vary from person to person—this is why you should get allergy tested. My mother had an allergy test that revealed hypersensitivity to citrus fruits, wine, mold, and trees! As an avid gardener, she was gutted, to say the least. Still, it’s better to know what your body does and doesn’t like. That way, you can be conscious of the things you can and cannot touch. Personally, I find that milk and lemons are my problem foods. Whenever I eat them, I end up with the worst eczema ever—my hands blister up, and I develop hives all over my chest area. It's weird because my food allergies developed out of the blue. It wasn't until I went on an intense detox that I realized I had a food sensitivity all this time. It is a good thing I discovered this when I did because I would still have dreadful skin! In addition, my severe, long-term back acne also cleared up altogether after I eliminated the problem foods from my diet. Bonus! I also find that acidic foods in general, such as tomatoes, really aggravate my inflamed skin when I handle them. Wearing gloves can help in this instance. Just make sure you are not allergic to the gloves themselves! Find out what is causing your contact dermatitis and then avoid exposure as much as possible. If you can, remove exposure completely. Choosing different personal hygiene products and detergents is often a good place to start. As we all know, manufacturers can change their product formulations from time to time so always check the ingredients list for hidden preservatives. If it’s full of words you can’t pronounce, put the bottle back on the shelf and choose something else. If you can't figure out the cause of your skin condition, please consult a doctor or skin specialist—they can test you for allergies and sensitivities. Hopefully, this will highlight the problem. My heart goes out to everybody suffering from this miserable skin condition. If any of you have any comments or suggestions, I look forward to hearing from you! Thanks for reading. 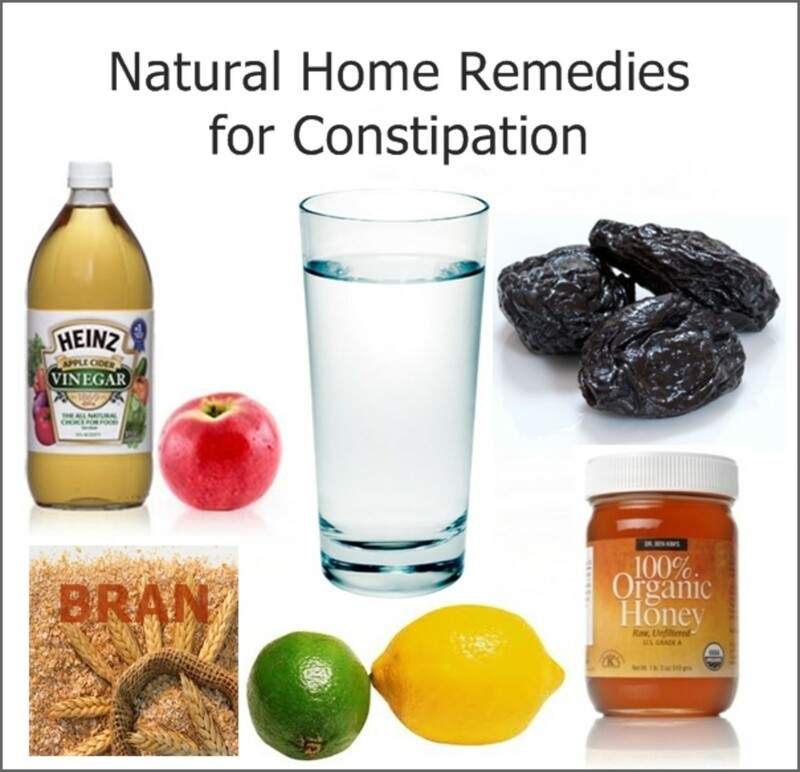 10 Best Natural Home Remedies for Constipation, Including "The Bomb"
I recently developed a rash inlynon my knuckes . Don't know what it is but reading I know It has to be contact dermatitis or eczema . Doctor gave me hydrocortisone 2.5 it helps when it flares up but then it'll return . It's my knuckles only but I am scared it might spread . I've been stressing over it . Any advice ? If you're too lazy to make these natural ingredient, read below! I suffered from allergic contact dermatitis for two weeks now and nothing had made it gone down. I didn't want to use steroid ointments because they might bring it down for a couple of use but the rash might come around again more inflamed and worse. Since nothing was working for these past long, itchy days, i decided to go to the pharmacy and use my unused prescription for Fucidin (steroid) ointment. Strangely, the pharmacy was not in stock of that ointment. So i bought this over the counter cream since i was lazy to find another pharmacy- mind you, i was in oxford street and i was extremely tired due to the lack of sleep i've been getting caused by this troublesome rash. What caught me by the eye was that the over the counter cream was steroid free. I tried it today for two hours and i kid you not, the itchiness the dryness the scaliness and the bumpiness went down extremely. It's been 5 hours now and it's nearly completely gone. The cream is called DERMALEX SKIN IRRITATION FOR CONTACT DERMATITIS STEROID FREE and it's definitely a miracle worker!! I think it's a new cream hence i never heard of it. It's 20 pounds (UK) and i wish i had found it earlier which could've saved me 600 pounds from having the private dermatologist appointment. This is by far the absolute best article I've read regarding my skin condition. This article was full of so much useful information thank you so much for sharing your story and allowing us to learn from your journey. I will be scheduling an appointment to get allergy tested next week in addition to starting a detox. I will also order more cotton gloves stop using the prescribed medication that only seems to be making my condition worse. I still have a ways to go yet to identify what is actually causing the dermatitis but at least I feel now I have a road map to recovery. Thank you again wish me luck! I am a life long sufferer and have found 2 things that work. Menthol and a thick barrier cream mixed together. I had a chemist make it up for me. Really soothing and moisturising. Also, when I was at my wits end I started experimenting with anything and everything. I know this sounds bizarre but I use Sensodyne whitening toothpaste. Yes toothpaste! Instant relief, it feels cool on the skin, drys immediately, stays on for hours, and its cheap and available everywhere. I am a nurse and wash my hands every few minutes. As soon as they get red or itchy, on with the toothpaste for instant relief. I haven't tried the plain sensodyne so I don't know if the whitening has anything to do with it or not. I haven't tried other toothpastes either but other brands might work just as well. I have found my cure and hope this info can help others. Yes! This article shows exactly what I have, eczema on the hands. It is come and go, but I need to try the other solutions too. Great article, and my problem foods are avocado, dairy, and gluten, but I can't live without those. I am trying to shower less, and find soap and cream remedies that are all natural. Even still, with all the natural aides, some allergens can still pose a major problem. So, the best thing is to just test a small area and then determine if it is viable enough. My eczema started when I got my new dog 6 years ago. Plus, I was exposed to some cleaning chemicals that had bad toxic agents in them. My skin hasn't always been damaged, and the relief is starting to work, but I need a complete solution. Oh my gosh thankyou so much for this article, the first one I've read which describes EXACTLY what happened to me.. I've reached the point where I'm looking for cotton liners because even the air irritates my hands now and this has not gone away for months. Nitrile gloves started this and all I want to do is wear gloves. Will be trying your recipe asap as every cream I've tried hurts and makes it redder. "How to get rid of..." in the title is misleading as the blog describes how you cannot get rid of it. My question: Is that true? Does it eventually go away? 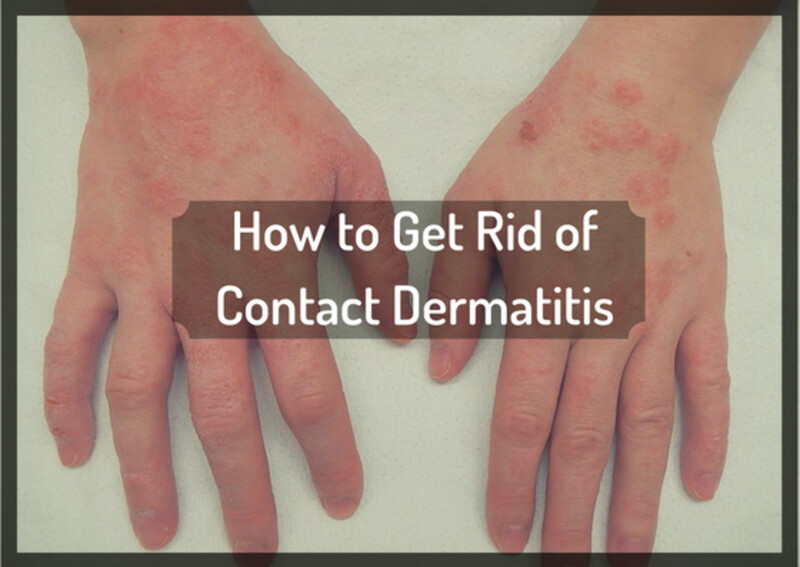 The blog is called "How to get rid of contat dermatitis" but, unfortunately it is about how one cannot get rid of it. I would like to know if it actually goes away after those 8 months. Try to use foderma serum and this serum is pretty amazing! I've had eczema since I was a very young girl. I recently had 2 of the worst breakouts I've ever had within a month of each other. Each left a large black blotch on my chest and lots of scars all over my body due to rashes everywhere. I was able to tame the symptoms a little, but not fully. Foderma serum not only removed the itchiness, but quickly removed the scars! Hi everyone, I Find this article/forum helpful. I also suffer from contact dermatitis on my hands only for years but it was just recently that it became severe. I work in a Nursing Home so I wear gloves all the time. My skin is dry & prone to cracking. I wear bandaid all the time. The cracking got worse so I Went to see a Dr who prescribed me with steroid cream. I didnt want to use it but it was the only thing that's helping me. i reluctantly finish a tube which lasted for 2 yrs on & off use. I was worried that I'll pass it to my little one who im still nursing. I eat pretty healthy, mostly vegetables & take supplements. 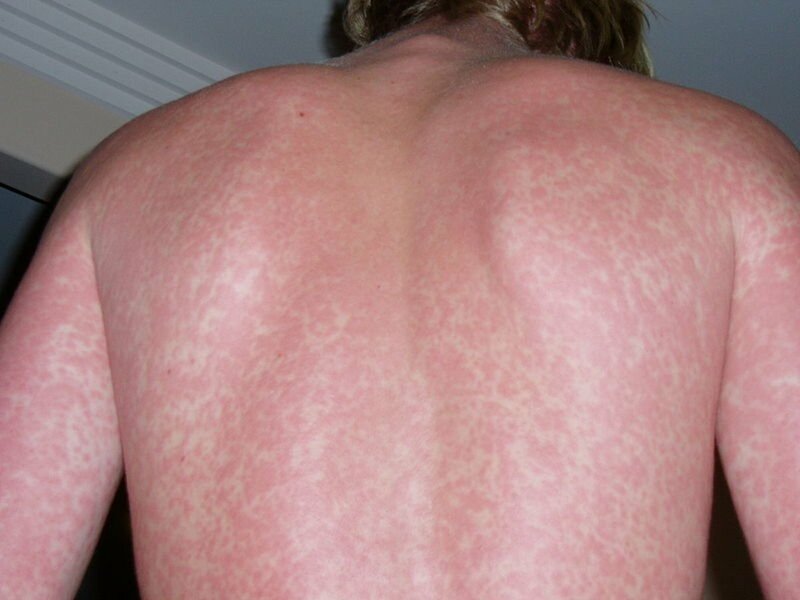 I dont understand why rashes are getting worse. I wear cotton liner under nitrile gloves. I avoided vinyl gloves as I initially thought that that was causing the rash. I switched to unscented soaps. This condition is horrible, embarassing & depresssing. Its also painful & stressful. I try to avoid gloves as much as i can but i have to wear them to protect me from catching any bacteria at work. And as soon as i wash my hands, they look red & swollen. It limits me from doing chores & taking long showers. Laura, I have NEVER in my 40 years had anything like this. After a few months, I self diagnosed it as nummular dermatitis. I am unsure where it originated from but am desperate to do this naturally; without antibiotics or steroids. It started out as a coin shaped spot and is now all over one leg, spread to the other leg and now I have a spot on my back side of my hand and another patch on my stomach. One major change was moving from Kansas City (cooler climate during winter) and I now live in Northwest Arkansas the past 18 months. I've recently started an anti inflammatory diet that also aligns with cutting out similar foods that may trigger dermatitis. It's been 30 days on this diet and its WORSE!! Could this be from the detoxing? Also a few days ago, a DoTerra essential oil rep made me an oil blend that made it WORSE immediately after using it, I stopped using it. My next step is allergy testing& bloodwork. But I do not have insurance so I've been trying to do this on my own. And feeling like I'm failing miserably. This is all very frustrating ... as you know! I just want to find a solution. I have this type of dermatitis on a small area of my right hand. Shall I still do a food allergy test? Hi Laura I really enjoyed reading your webpage on contact dermatitis it's a relief to know that I'm not alone with this problem, although I wouldn't wish it on anyone. I, like you work in the health industry and seem to have developed a massive allergy to the nitrile gloves. I'm currently off work on maternity leave and all the nappy changes and hand washing hasn't made my hands any better and i have been getting pomphlyox ezcema on both palms and fingers which has actually been the hardest thing to get rid of and seems to get worse when I'm hot. So with a few months left before going back to work I'm determined to see a dermatologist to get an allergy test. I'm hoping if I have food allergies it comes up on the test too. I've pretty much put all the testing on hold for 15mths while I've been pregnant and breast feeding - so it's been pretty hard to cope with. It's such a difficult thing to have and has at times made me feel slightly depressed. Thank you so much for sharing your story. hi Maria! your daughter's symptoms sound very much like mine. I went to the dermatologist and was diagnosed with discoid lupus and given a steroid cream. as someone stated here, that only worked temporarily. I even went all vegan thinking it was diet related. Only slight relief there. I made the assumption that it was hair color because I used it in my own hair and at work. so I stopped coloring my hair and cut all of my colored hair off. huge improvement. I had started only water & mircro fiber towel or oil cleansing my face. and stopped wearing foundation. and starting water rinsing and usually on my own homemade hair care products. and my face was doing perfectly fine until a fouple of months ago when I was invited to a party for a some "all natural product line" where the rep gave mini facials. Well that just jumped started the skin problem again. it started small but everytime around my menstrual cycle it flares up. so as this article states it can take months for it to clear up entirely once you have avoided the irritant. just like your daughter's it may appear to some to be a ringworm. and when this first started, that is exactly what I thought I was dealing with but all the fungicide products did was aggravate my skin causing the area to worsen. I am going to incorporate more foods with high levels of B vitamin to see if that helps me overcome being so sensitive to everything that touches my face. I do hope since your post your daughter has found relief. My 14 year old daughter started out with a very small rash on her upper cheek which wouldn't go away with hydrocortisone. Took her to her pediatrician and they said it was a ringworm. She was treated with fungal cream, but it didn't work got worse. Then they prescribed Mupirocin cause they said she had an infection. Went to a dermatologist & they said it was impetigo & prescribed tetracycline & ointment called Kerotasek. That didn't work either it it was still red & oozing. Second dermatologist prescribed Lamisil and Mupirocin caused they said she needed to be treated for fungal. That didn't work either, with the ointment her skin got red, yellow crusty, and inflamed. Went back to see another dermatologist and they said it was allergic contact dermatitis so they kept her on antibiotics Stadin & prednisone. I saw quick results with the prednisone, but once she tapered the meds it will flare up again. Now she's on prednisone, Lamisil, & stadin nothing topical due to anything she puts on her face makes the allergic flare up. They put her on a higher dosage of prednisone & it cleared up about 50% but now that she's tapered the meds is flaring up. Is getting yellowish crusty & a little red. Doc mentioned that they might have to do a biopsy, but I dont want that since it will mean having a scar on her face. Is been very frustrating. Any suggestions on what else I can try or what else it can be? I have had dyshidrotic eczema(hands) and keratosis pilaris(arms) for years, but recently my eczema broke out very badly and it is just slightly starting to heal up. I stopped going to the dermatologist because the creams never actually healed my eczema, and the potential side affects were horrifying - various cancers, infertility...the list goes on. My mother makes me a cream of various essential oils, which helps, although my eczema for some reason just wasn't healing up this time. Even my keratosis pilaris was getting worse. I also developed eczema on my toes as well. It's rough going to school with this every day, and most of the homeopathic creams I use (that work) are rather strong-smelling and make me even more self-conscious. I started using Aveeno on my hands, and when there was extra I would put it on my arms. I already knew Cetaphil made my arms break out in pimples, and that I'm sensitive to mineral oil and fragrances. Within a day, my arm broke out in terrible contact dermatitis, and my eczema spread down my hands and wrists. It's been about two days since I stopped using the Aveeno, but the rash is still there. My hands are healing up a little at a time, with daily oatmeal/stinging nettles soaks and jojoba and almond oil. I do martial arts and it's very embarrassing to be in physical contact with others when I have awful rashes and blisters all over - I feel like I look as if I've got some terrible contagious disease. I'm still unsure what the cause of everything else is, but reading this article made me feel a bit better about having multiple skin issues. If none of the conditions start to heal up, I might just go get allergy tested. I had absolutely no skin problems when I went away for two weeks and ate only organic food, no white sugar, and very little dairy. It is a difficult struggle for anyone out there with sensitivities that affect the skin, but I'm glad I'm not the only one. Hi Peggy, if you are worried, I would get it checked out. The doctor will probably give you a steroid cream to clear up the rash. These creams do speed up the healing time dramatically, although long term use can cause the skin to become paper thin and vulnerable to tearing. The doctor may also give you an emollient cream or antihistamine tablets to reduce the itching. Next time you see your therapist, make sure you tell them what happened, so they can use a suitable alternative. I hope you feel better soon. i got my rash from latex tape my physical therapy used on me for a couple a days. I took the take off and it was fine. But maybe 24 to 48 hrs later I broke out bad . I'm using anti-itch cream it will help for a bit then start itching again. This is my first time I have ever had a rash like this. Should I go to the dr? Thanks for the information was a great help. Had never thought about diet as a cause just though about things I was touching. One of the first things I will do is eliminate milk from my diet. Some great advice and ideas. Hi Amy! You must be so frustrated. It is so infuriating when you try every treatment possible and still find no relief. I went through this pain and discomfort for a couple of years and I was completely baffled. Specialists were baffled. It made me feel very alone and miserable. Don't lose hope though. I am really happy that so many people have shared their experiences here - it just goes to show you how diverse this condition is. What treats one, may do nothing for someone else. However, if you are stuck at a dead end, it is nice to know there are different things you can try to encourage healing. Did you take pictures of your skins reaction so you can show your specialist, the next see him or her? Even though it is really annoying that your skin showed a delayed reaction, it sounds very encouraging, especially the rash in the shape of the square. Sooner or later (with the help of your journal) you should start to see a correlation when your skin gets better or worse. Whether it is washing up the dishes...eating a certain food etc. I came upon this article/blog a week ago today, reading it makes me feel that I am not alone!! My dermatitis has consumed my life in every aspect of the word! So far I have been to 3 different dermatologists and their conclusion after having me do patch testing for a week was inconclusive as I had no reactions to any of the patches... till just 2 days ago.... 2 days ago was exactly 1o days since they removed the patches... I just cried as I have no appointment with them to follow up this late, is this even possible to have a reaction to something after that long of being exposed?? I would think it is just spreading however the spot on my back is a perfect square.... My hands are the place on my body that is most affected by the dermatitis! I have been keeping the salve you shared above on my hands nearly continuously since last Monday, it does soothe! I have cut dairy out and now planning this week to just eat veggies, beans, rice and a little fruit. This is a hard time of year to change your eating habits however I am desparate, for goodness sake, I am ranting on a blog... not my norm!!! I am working on getting better at dealing with stress as I know that is a large cause of mine! I have been directed to start a journal, I believe your site is the start of my journaling! My heart breaks for all that have to deal with this disorder! Thank you to all of you that have shared your story to make this girl who has most her life felt like she has it all together and now feels like she can't even function without sobbing, itching, bleeding, your stories have brought comfort to me in knowing I am not alone!!! If I find any miracle I will certainly share!!! Hi Janice, I was already vegetarian and transitioning to a vegan diet anyway so I felt comfortable eating raw without the supervision of another professional. I consumed all sorts of fruits, vegetables. nuts and beans and consumed plenty of green tea and water. In that time, hives appeared all over my face and body as I was detoxifying. It was pretty uncomfortable to be honest. After two weeks, I slowly introduced food groups back into my diet...cooked lentils...rice...milk. It was then that I had a terrible reaction. My eyes swelled up and blisters appeared all over my fingers and hands. It was then that I knew I had found the culprit, even though I had never had problems with milk before. The whole time I was consuming dairy, my body was 'dumbed down' so to speak and it was difficult to pinpoint the allergy. If it wasn't for me detoxifying myself, I would probably still be suffering now, without a single clue to the cause. My doctor gave me steroid creams too. You know what I did with them after I discovered the cause? I threw them in the bin. It felt GREAT. Did you see a naturopath for the raw diet? I've been a long term eczema sufferer but lately it was unbearable. My GP just keep giving me steroid cream prescription. I've read lots of websites talked about avoiding certain foods, but I don't know where to start. Hi Juliana! That is an interesting point you make about hormones and the link to Dermatitis; a question I can't answer with certainty because I am not a skin specialist. Although I have wondered that myself since I was never allergic to milk until recently. One possible explanation, could be the artificial growth hormones given to cows these days. I am not saying that you have an allergy to dairy because at the end of the day, everybody is unique and it would be silly to assume you have the same as me. Although I am using this as an example, as to how alien substances enter our bodies. Another worry is pesticides in fruit and vegetables. Just like you, the rash only appears on my hands, despite the fact that I ingest the milk. One would think it would affect the whole of my body but for some reason, I just get a localised reaction. To be honest, I just don't think there is enough research done on the subject. If I was studying to be a doctor, it would be the thing I would do my thesis on! So many people are suffering and its just really sad to see. Allergy testing is quite often done on the back. They will make tiny little scratches on the skin surface and apply various allergens on each one. They will then make a note of what substances the body takes a dislike to. Oatmeal is brilliant. I love oatmeal. That is why I love the product line, Aveeno. It really soothed my hands when they were bad. Ultimately though, the only thing which offered me total relief was avoiding the allergens causing the problem. I also forgot to ask, will an allergy test still work on the forearm if I have only ever broken out on my hands?? Because the allergy on my forearm could easily just be hot water possibly. Im just soo tired of struggling with this and im willing to try anything. They gave me cortizone steroids but I just broke out to it. They are trying to put me on an even more hypoallergenic one but Im soo petrified to try it and would love to try something more natural. Ive heard of oatmeal baths as well but not sure if that will help. I guess its just always a trial and error. Can hormones make contact dermatitis worse? Im pumping and giving breastmilk to my son, and it just seems like the longer I am giving him milk, the more things I break out to. I used to only break out on my hands (which is still broken out) but now im also breaking out on my forearm when I use shampoo. Hopefully I can find some products to help cure this. Thanks for the great advice and if you know about anything with hormones making contact dermitits worse, id love to hear about it! I just thought Christina, another reason it could have come out lumpy is because you took the mixture off the heat and left it too long before stirring. If the mixture starts to set too hard, then you start mixing it up, you will end up with a lumpy balm. Hi Christina! If you find it is too thick, you could melt it again and add more base oil. When it sets, it will be a lot softer. It just depends how firm you like it - it should be quite thick because the beeswax will have more of a barrier effect on the skin. If it comes out in clumps, make sure the oil and wax is completely melted and allowed to set before use. When the beeswax is not completely dissolved and blended with the oil, it will be lumpy. Another tip is to turn off the heat and carry on stirring as it cools down. As it sets, it becomes more of a paste than a 'set' balm. I will amend the recipe to reflect this - thank you so much for your feedback! Hello! I have a question about the balm recipe. We attempted to make it last night (but I think our ratio of wax granules to oils was off) it finally got to where it was pretty thick. We got it into a jar but it's almost impossible to dig out, it comes out in clumps. Is this normal? Or should it be thinner (I'm thinking like a foot lotion). Any tips for this recipe would be greatly appreciated! Thank you! My husband seems to be allergic to nitrile gloves. He got itchy patches on his fingers, than the skin got thick, hard,and now he has painful cracks in his fingers. He hasn't been wearing the gloves lately, but the skin cracking doesn't seem to be getting better and it's been a month or so at least. What can I put on his hands that will help them heal? That is interesting about your allergies getting worse as you get older - I always thought it was the opposite? Perhaps that is a myth! I suppose if you are coming into contact with things that cause your immune system to fight all the time, your skin is going to become more and more inflamed. The problem with doctors, is they are too eager to give people steroid creams as a quick fix. It is true, they do help for a while but it just masks the condition temporarily. It doesn't get rid of the cause. Each to their own though - they may work great for some people (and good luck to them if that is the case). For everybody else though, the quest continues for a cure! Maybe you could request an allergy test from your doctor? My mum had one; she said they took some blood and did a series of tests to determine the cause of her skin rash. Turns out she was allergic to citrus, mould, trees, dust and cat hair!!!! Who would have thought!? Hope your problem clears up soon. Best of luck. Hello! Thank you for this. I have always had allergies, which seem to progress in severity with my age. I recently moved in with a friend who has cats and have helped with feeding them as needed. Then I developed this odd condition that I just couldn't figure out. Turns out its contact dermatitis caused by the metal of the cat food cans, which she has too. Thank you for this information, its more real world than all of the jargon my doctor gave me, and more easily understood than other online resources. Take care. Hello Summer, hope your date went well - did you use concealer on it in the end? I wouldn't be able to recommend one way or another but what I have found useful (if you are pale like I am) is to apply nappy rash ointment such as Metanium or Sudocrem to reduce the redness. It really does tone the inflammation down, on the condition that you are not allergic to any of the ingredients. It also helps to reduce itchiness, which is an added bonus! On the other hand, everybody is different and what works for me, might not work for you. If you do try covering it up with something, maybe do a patch test first? I definitely wouldn't apply it to broken skin since you could end up with a nasty infection. The less you mess about with it, the better in my humble opinion. Just went to the doc today for a contact dermatitis rash covering half of my neck. Got a perscription which I'll be taking around 8pm. Have a date at 9:30...is it okay to use concealer on this!? Thank you! Hello Sami, good to hear from you. It is amazing how many people struggle with Dermatitis and for so many reasons - for me it was and still is a struggle. As soon as I think i'm winning the battle, I get another attack of it. Luckily for me though, I know what my triggers are. I am allergic to the Nitrile gloves at work but I also discovered I had an underlying milk allergy too! It was making my symptoms so much worse - my hands are usually the only things to get affected though, nowhere else. Do you wash your hands a lot like I do? I might start washing my hands in honey - very soothing, hydrating and also naturally antibacterial...might make me very attractive to insects though! Eeek. You are possibly right though, personal hygiene products can be really drying, especially washing up liquid. Boots do some really great hypo-allergenic, cotton lined washing up gloves. They have made such a difference to my skin. Thanks for this web page, its given me a lot to think about! I have been going through an extreme outbreak of contact dermatitis for the last 4 months and the only thing to settle it down was cortisone tablets, and they made me feel totally awful! I have just come off them and wouldn't you know it, my itchy rash is coming back. I am at the moment going through the process of elimination and it is tough stuff! I am so exhausted and just want to know already what it is but I think im getting there. Stress was a massive part for me too but its hard not to stress when you feel low in confidence with something like this. Interestingly (and I need to add this to my article) I noticed my skin problems coincided after I had a series of Hepatitis B vaccines - I recently developed a dairy allergy out of the blue, which manifested shortly after my 3rd booster shot. K and Brittany, are your hands only affected? I hope you are not suffering too much. It not only affects life at work, it affects ones social life too. I wouldn't wish the pain on my worst enemy! Thanks for the advice. I've been suffering for about two years now and my boss won't move me to a new area. The derm told me to quit my job but that's not a viable option. Hopefully soon I will be able to do something else.